Our poured concrete foundations are solid through and through. To ensure your basement stays dry, we wrap the entire basement with Platon®. Platon® is made from tough, durable, high-density polyethylene. This membrane provides superior moisture protection. It is a dimpled 24-mil. wrap that separates water from the foundation wall and permanently bridges foundation cracks, preventing moisture from entering the basement of a home. We also install a continuous “Form-A-Drain”. 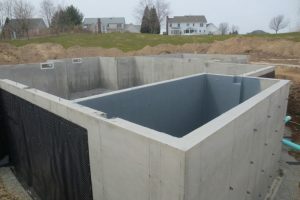 These drains form a complete sub-slab perimeter loop around the foundation Any and all groundwater is channeled into the crock for sump pump removal.